Potato Dextrose Agar (PDA) is used for the cultivation of fungi. Potato Dextrose Agar (PDA) is a general purpose medium for yeasts and molds that can be supplemented with acid or antibiotics to inhibit bacterial growth. It is recommended for plate count methods for foods, dairy products and testing cosmetics. PDA can be used for growing clinically significant yeast and molds. The nutritionally rich base (potato infusion) encourages mold sporulation and pigment production in some dermatophytes. Potato Dextrose Agar is composed of dehydrated Potato Infusion and Dextrose that encourage luxuriant fungal growth. Agar is added as the solidifying agent. Many standard procedures use a specified amount of sterile tartaric acid (10%) to lower the pH of this medium to 3.5 +/- 0.1, inhibiting bacterial growth. Chloramphenicol acts as a selective agent to inhibit bacterial overgrowth of competing microorganisms from mixed specimens, while permitting the selective isolation of fungi. Note: Do not reheat the acidified medium, heating in the acid state will hydrolyze the agar. Potato Dextrose Agar is used for the detection of yeasts and molds in dairy products and prepared foods. It may also be used for the cultivation of yeasts and molds from clinical specimens. Potato Dextrose Agar with TA (Tartaric Acid) is recommended for the microbial examination of food and dairy products. Potato Dextrose Agar with Chlortetracycline is recommended for the microbial enumeration of yeast and mold from cosmetics. Potato Dextrose Agar with Chloramphenicol is recommended for the selective cultivation of fungi from mixed samples. Note: 200 gm of potato infusion is equivalent to 4.0 gm of potato extract. To prepare potato infusion, boil 200 g sliced, unpeeled potatoes in 1 liter distilled water for 30 min. Filter through cheesecloth, saving effluent, which is potato infusion (or use commercial dehydrated form). Mix with Dextrose, Agar and Water and boil to dissolve. Autoclave 15 min at 121°C. Dispense 20-25 ml portions into sterile 15 × 100 mm petri dishes. Final pH, 5.6 ± 0.2. Add 39 gm of Commercial PDA Powder to 1 Litre of Distilled water. Boil while mixing to dissolve. Final pH of 5.6 +/- 0.2 at 25 degrees C.
Final pH of 3.5 +/- 0.3 at 25 degrees C.
After sufficient incubation, isolated colonies should be visible in the streaked areas and confluent growth in areas of heavy inoculation. Aspergillus flavus: Powdery masses of yellow-green spores on the upper surface and reddish-gold on the lower surface. Penicillium chrysogenum: Olivaceous green with sterile white margin on the upper surface and Orange to red, wrinkled on the lower surface. what difference potato infusion and potato starch. We are using our auger for air tests. Does this need to be at room temp before we set it out and how long is the incubation? 5 days? Hi, may I kniw what is the different of PDA and Sabouraud Dextrose Agar? They seem serve the same function. I would like to ask if you prepared the PDA and refrigerate for 2 days. Does the PDA will spoil? Only if contaminants are present on the agar. It will eventually dry out. 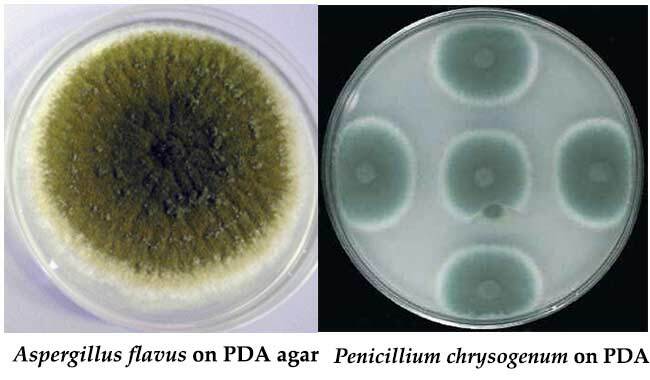 What is the reason behind pigmentation by fungus in Potato Dextrose Agar???? How long doea it take for the potato dextrose agar to dehydrated when left open? This is for our research thanks!